Thanksgiving. A convivial gathering around a long wooden table, laden with food and filled with laughter. The familiar cadences of a feast, yet one with unfamiliar origins. We were temporarily adopted into our collaborators’ lives and welcomed as returning family members. Kith and kin, ken or kin. Akin. Some rootless others uprooted, weathering the end-of-term academic storm. A temporary intensification of familiarity. Threads are picked up from conversations months old. Our relationships with members of FoAM’s distributed clan have begun to follow the rhythms of nomadic journeying. Deep and involved when we briefly occupy the same spatiotemporal dimension, loose and relaxed while we travel elsewhere. An irregular pulse of welcomes and farewells, of subsuming and letting go. 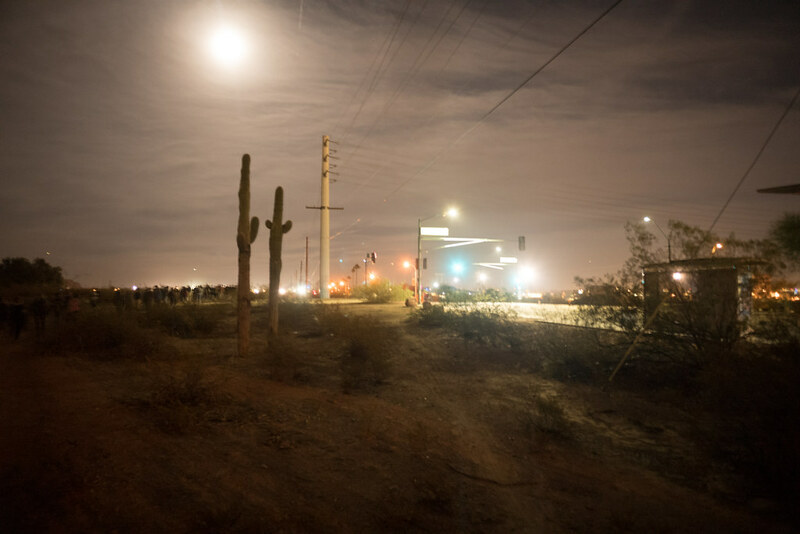 We spent two weeks on and around ASU — immersed in university life and surrounded by urban sprawl — inquiring about the relationships between people and the desert. Uncovering the mythical foundations of contemporary lifestyles. Seeking out counter-myths more closely attuned to the desert environment. Exploring the topological spaces of bodies as fields, bodies as listening devices. Creating propositions, designing experiments and publications. Conversing. Reading. Listening. Aligning. Futurecrafting. Socialising. Falling asleep and waking up to the sound of airplanes and air-conditioning. From time to time we would follow the edges between city and desert. Searching for sites of dust and shadow, where the city-desert and the wilderness-desert entwine. The Piestewa peak, Moeur park. We followed the shadows along the abandoned “Cut” of a railway that was not to be, in the remains of utility poles, in the cairns beneath a flight path and a wetland between two highways. We traced a path of divination. 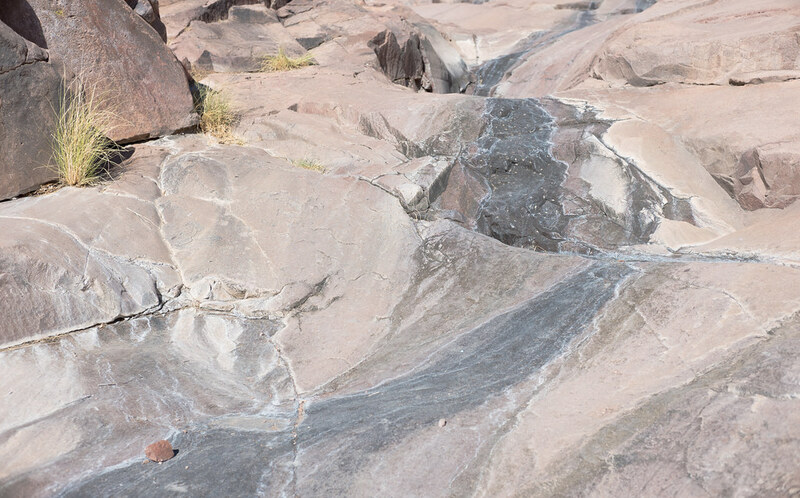 In the delirium of heat and jetlag, we hiked into the Superstitions in search of the mythical source of dust storms, finding enigmatic petroglyphs and a dry creek bed. 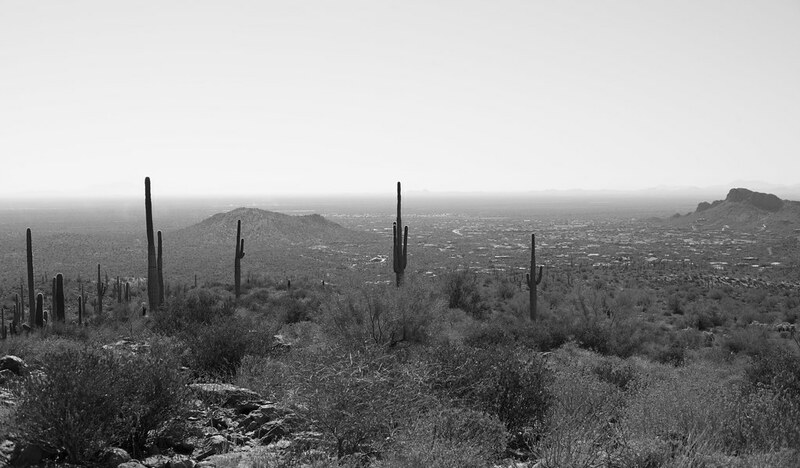 From our higher vantage point the city became a mirage, merging into the hazy plain punctuated by saguaro cacti. Centuries of civilisation evaporated in that mirage. Occasionally re-appearing with small groups of hikers, a procession of jeans, t-shirts, sneakers, ball caps, water bottles, snacks, dusty shoes and sunglasses. 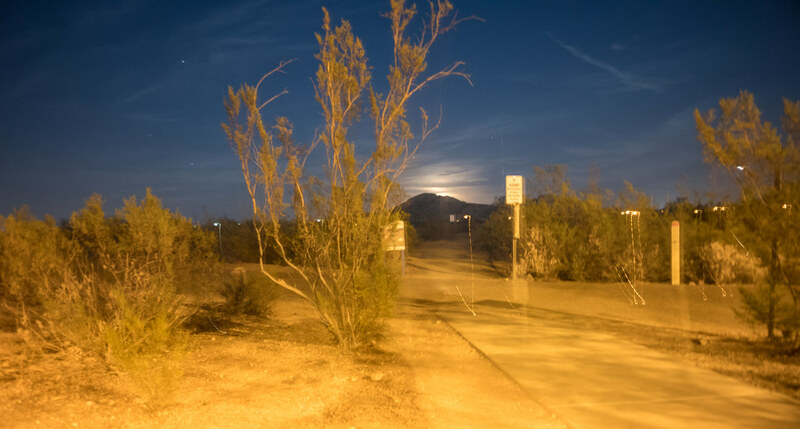 At full-moon, we joined a larger group for a night walk in the liminally illuminated Papago park. Silence without stillness. The hum of internal and external traffic pulling at our attentions and perceptions. 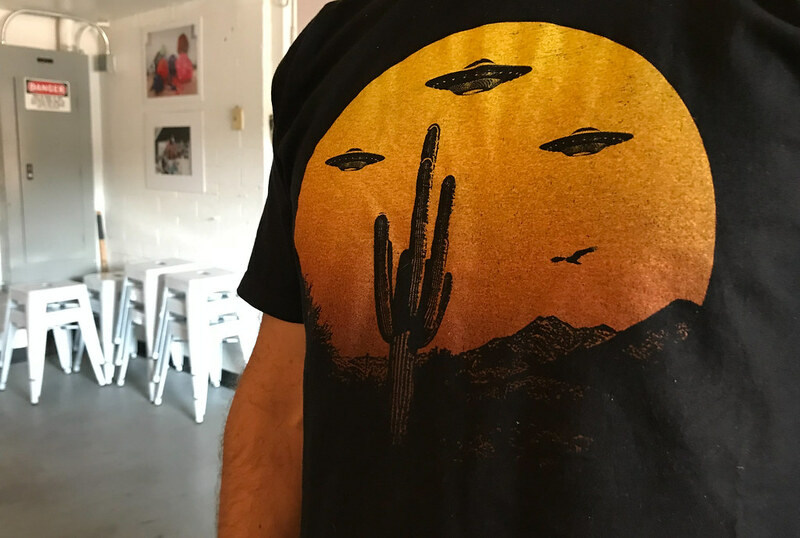 We observed a retelling of colonial history in which alien ships take on a multiplicity of sinister meanings, in stark contrast to the narrative simplicity of the exhibits at the Superstition Mountain Museum. We listened to the Legend of the Lost Dutchman, a story of places where people, treasure, mines and even whole towns vanish into the landscape, never to be found. We traversed personal and cultural memories in search of an experiential imperative. Sacred objects, collected materials and traces of the desert across suburbia became text. A tuft of coyote’s fur, a date, a red rock, a cholla spike, and a drop of mezcal, drunk with friends under the vast, darkening skies. “Deserts possess a particular magic, since they have exhausted their own futures, and are thus free of time.” — J.G. Ballard. The Atrocity Exhibition. 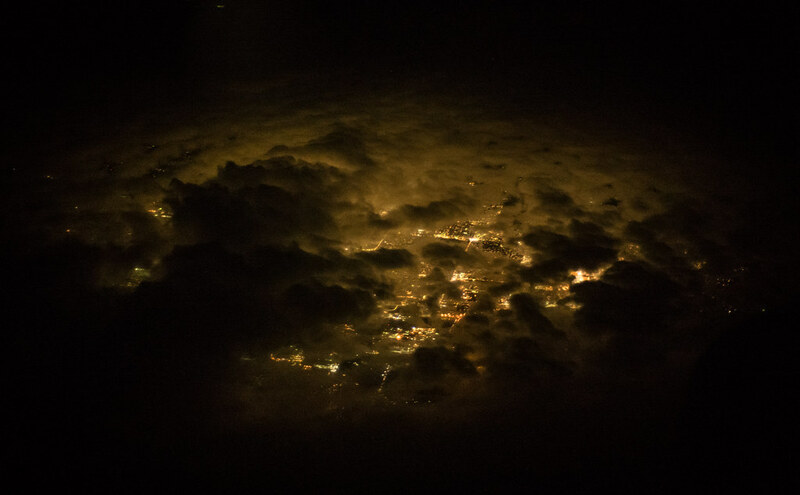 Phoenix and its environs simultaneously fascinate and distance. Our daily walk between the anyplace AirBnB and Lab for Critical Technics (LCT) offered a brief opportunity for casual ethnographic study. We were greeted warmly each morning by “Mexican” construction workers. The traffic light (with frog-like certainty) ordered us to “WAIT” for the endless multi lane procession of cars (single driver and driverless predominantly). The dispersed choir of homeless veterans from the endless war droning in refrain under their most inventive shades. “Spare any change for a vet?” Nearby, the Salvation Army Cafe serves Matcha Latte while half-finished buildings advertise their future as generic condos. On campus, The Biodesign Institute grows new copper-clad extensions, while the English department is shuffled further from the daylight. ASU is offering exchanges with an Australian university to study cancers affecting the Tasmanian Devil. We enter the Synthesis Center, where clouds and simulated plants dance in responsive patterns around us. Outside, students are rushing to-and-fro fuelled by coffee in take-out cups. In front of a strip mall, cars are left running to keep the heat at bay. Arriving at our temporary studio in LCT, we watch as our hosts unload a pack of plastic water bottles. Tap water quality is troubling, they inform us. Here we are, working on a project funded by the Global Institute of Sustainability, looking at environmental issues in the region. 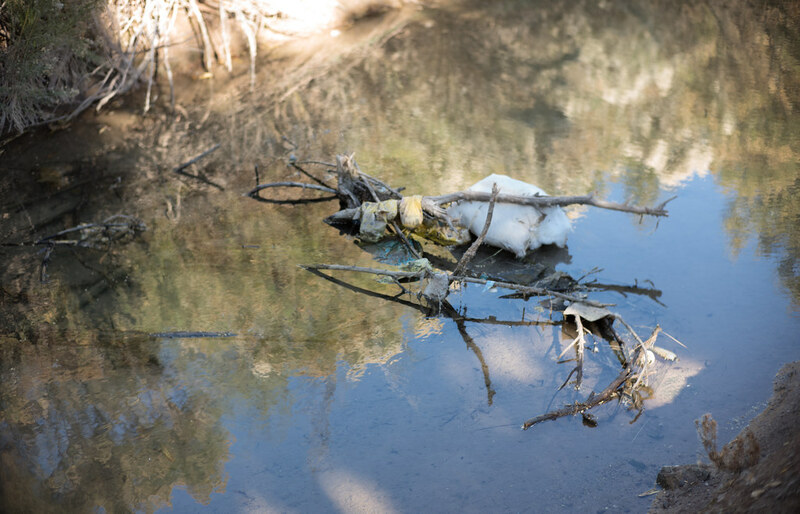 Even our short commute across Tempe suggests that environmental issues are an inextricable part of entangled social, economic and political realities. As China Miéville points out “Arms trading, dictatorships and murder are environmental politics.” They cannot be separated from pollution, climate change and renewable energy targets. What are the environmental politics in the North American South West, specifically to life in the desert? What are the implications for the people, plants, plastics (etc) and the environment they live in? What peculiar futures or parallel presents exist in this “Valley of the Sun”? What new worlds can emerge from a region swayed by the unpredictability of heatwaves, poor water distribution and over-enthusiastic promises of the tech industry? We travelled through layers of signals, systems and stories in search of the hardened sediment of metaphoric undercurrents. The libertarian ethos and protestant work-ethic ration desert time into the neurotic drip and trickle of temporal scarcity. Time is submitted to a relentless economic valuation. There is an inherent trust in “the market” as regulatory system. Politicians gamble with a growing population, in a labyrinth of tax benefits, cheap real-estate and myopic risk tolerance. Scale up Arizona’s 5Cs (cattle, climate, cotton, copper, citrus). Work must continue, no matter the conditions, in the “Sand of the Free, Sprawl of the Brave”. School starts in the hot, sticky month of August as kids hold tight to youthful curiosity while navigating a system caught between funding cuts. Idleness is still considered the devil’s playground, siestas close to sacrilege. The distrust of “elites” and rhetoric of self-reliance encourage a culture of conservative individualists and a precarious belief in the Dominion of Man over Earth. Water rights and food sovereignty stretch public infrastructure close to breaking point. Environmental problems tend to be tackled as single issues with inventive technological solutions. At the Palo Verde Generating Station nuclear reactors are cooled by sewage from nearby towns. Non-native oranges now thrive across the state. The “Smart City” of Belmont is taking root, born in a fever dream of real-estate speculation and the shimmering promise of technology. Yet a larger conundrum remains; Phoenix exists far from equilibrium, requiring massive external inputs for its continued existence. Despite the desert, not within the desert. Holding onto an idealised image of urban life, haunted by the shadow of its possible demise. Water, power and other essentials imported from afar to keep up an appearance of a stable oasis. The myth of the Wild West in a desert on demand. The purity (and dread) of the Wilderness kept at arms length, only to be occasionally appropriated for solitary transcendence, urbophobian escapism and utopian experimentation. Where both nascent and long gone ways of life overlap, a “Tech Bro Guru” becomes “The polyamourous cult leader” of Sedona wrapping a very contemporary hollowness around huckster tricks and Barnum effects. Alongside King Clone (the unassuming 11,700 year old creosote bush) lie the ruins of a vanished Pueblo Grande. And yet, here too could be found the American Gods, time-unbinding desert monks and the Dionisian world of the Carnivàle. We reached Shadow Belmont. A place deeply familiar with shade. Shade architecture, shaded transport, sheltered time. A cityscape layered with a latticework of porches, pergolas, verandas, galleries, awnings, canopies, umbrellas and trees. From above the city looks like a desert garden. The shade of the high canopy stands on cactimorphic succulent pillars, doubling as public water sources. Closer to the ground, multi-trunked mesquite marquees diffuse light across outdoor kitchens and intimate courtyards. 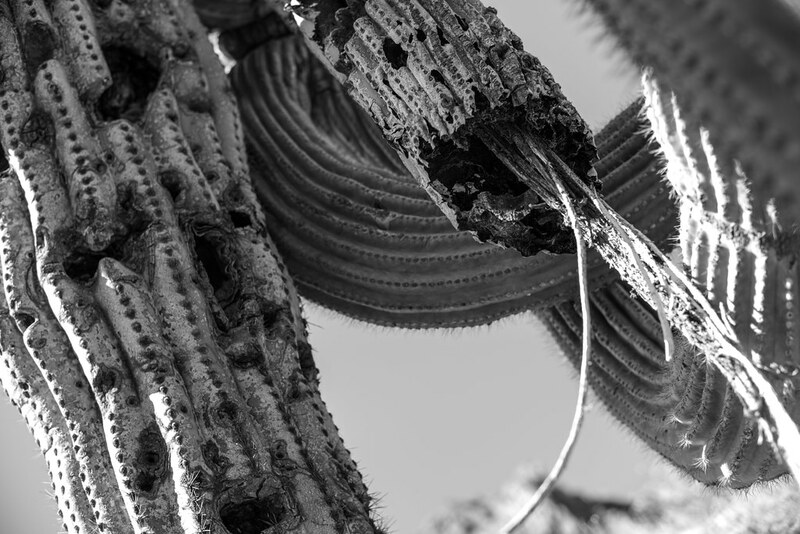 The ubiquitous antennae of the place mingle with soaring ocotillo vines, their cabling protected by dessicated saguaro skeletons. Solar-powered screens radiate the shadow forecast and a cooling breeze. The STA (Shade Traversal Association) maps show real-time shade developments, with roads in direct sun coloured flaming red. 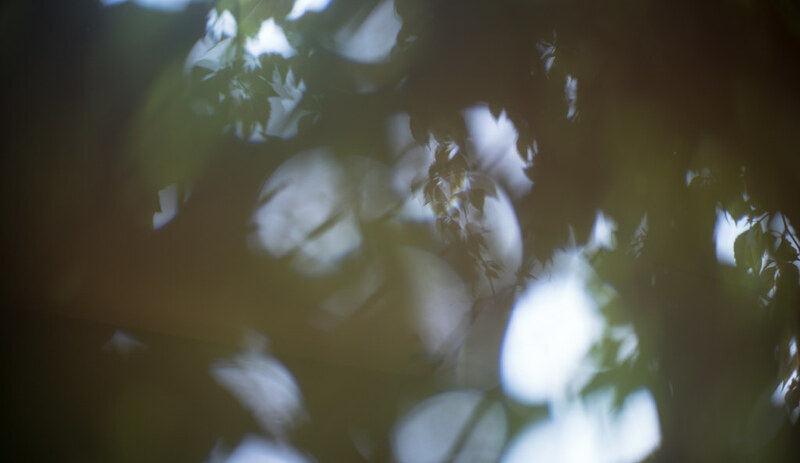 The droning of traffic blends into the murmur of slowly adjusting shade structures, punctuating the continuous background hum of insects, psychic noise and ambient communication. Shadow Belmont, a city enfolded in the long temporality of the desert. It abides in time marked by feasts and silences. All activity eventually ceases. Idleness is required to attune to desert time, yet it is a world capable of sudden bursts of ecstatic action, like blooms after a desert rain. A city in a city living the experiential time of spiders, snakes and saguaro. The variable abundance of time is sensed and modulated by the antennae-centric tech industry. Deep listening technologies. Nomad tech on smart grids accustomed to oscillations of resources. 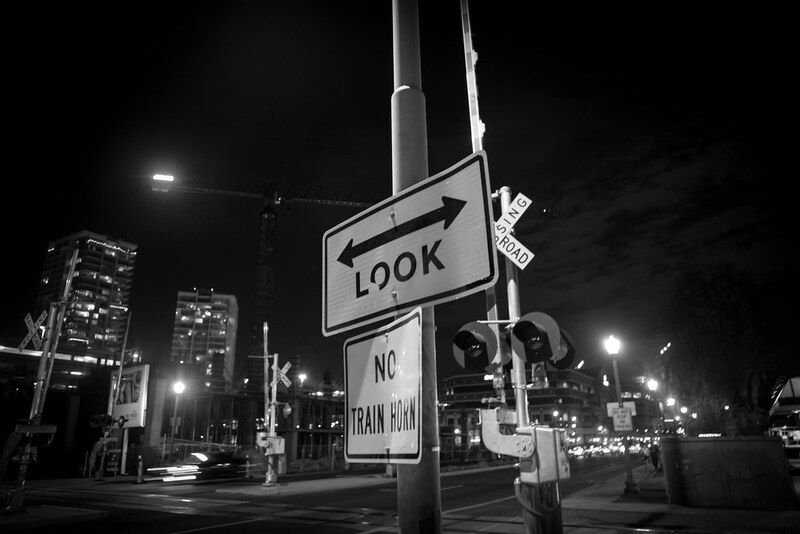 People and technology attuned to differentials and committed to the act. From independence to interdependence. From individual bodies to communal infrastructure, the city is continuously aligning with its changing conditions. A gradual redesign. From behavioural change to contorted comportment. The political and economic thaumaturges alternate between experimenting with hybrid governance structures and fighting shadowy battles for dominance of the three pillars; market, government and commons. In transition, the government functions as a medium between humans and other entities in the district. Water, for example, is treated as a nonaligned political entity in its own right. The shadow minister of trans-local affairs advocates “the social responsibility of a coven” and inclusion of an act for the rights of “diverse states of matter” in her inaugural speech. With drought cycles lengthening, water tokens fluctuating and heat waves becoming less predictable, self-reliance is gradually giving way to the security of commons management, stewarding the preciousness of life, in a desert teeming with life. And then it was time to depart. We run through the usual routine of packing and cleaning. Everything is dusty. As if the desert is clinging onto us as we take our leave. Months later we’ll still find its particles mingling with dust from elsewhere on our boots. Dust of places ground in the mill of time. Places that remain lodged in the alveoli of our lungs and the warm caverns of our hearts.